Just because something is a classic doesn’t necessarily mean there’s no room for improvement. Case in point: When I was a kid, my family spent Thanksgiving one year with the neighbors, including their gourmet-cook grandmother. Said grandmother was put in charge of the green bean casserole; imagine the gasps from my family members as she tipped a bottle of chardonnay into the bubbling pot of canned cream of mushroom soup. Half an hour later though, there were more gasps—this time of delight. She’d taken green bean casserole to a whole new level. Why use water when you can use wine? That was the gourmet grandma’s rule of thumb, and that’s the lesson I remember from that day. Okay, maybe that substitution doesn’t work all the time, but let’s just say wine is at least worth a shot in dishes like savory veggie casseroles. I’ve taken that lesson a few steps further and classed up the old green bean casserole even more. Why use cream of mushroom soup when you can use homemade vegan mushroom sauce? 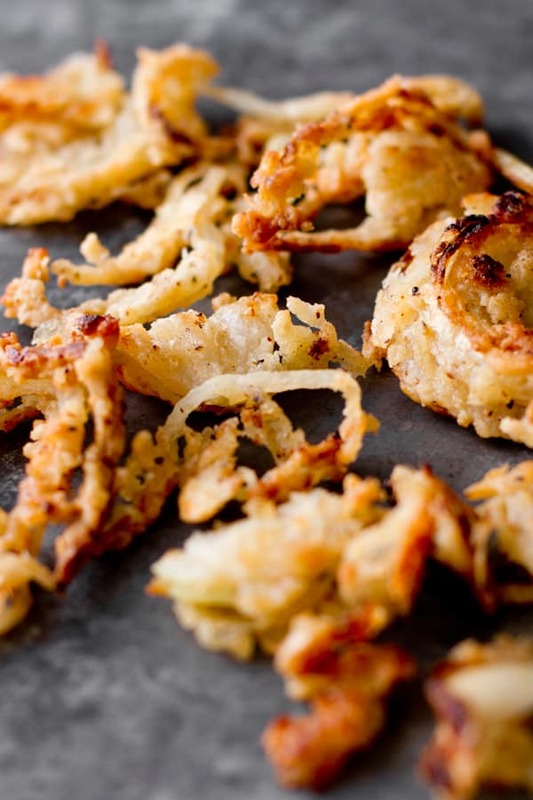 Why use prepackaged French-fried onions when you can fry your own onions? I kid you not when I say these changes made the best dang green bean casserole I’ve ever tasted. This stuff was amazing. Not “there might not be any leftovers” amazing, but, “there might not be any casserole that actually makes it to the table” amazing. The work required for this vegan green bean casserole is a bit more extensive than with the traditional version, but it’s worth it, not just to make the dish vegan, but to knock the socks off of every attendee at dinner. You can do a few things to mitigate that extra work. First, the French-fried onions need to soak for at least 30 minutes. Why not start them early in the morning or even the day before? Stick them in a storage container and refrigerate until ready to serve. You can also mix up the flour coating for the onions ahead of time, so when you’re ready for frying, they’re ready for you. You can also chop your veggies, or even do all of the stovetop steps for the casserole portion of this recipe, ahead of time. Put the casserole into a baking dish and stick it in the fridge until you’re ready to bake. Better yet, if you’ve got a cooking vessel that can handle the stovetop and baking steps, use it, and avoid having to transfer the casserole and dirty another dish. A 10″ cast-iron skillet works perfectly here. This post was originally published on November 13, 2014. This vegan green bean casserole is made with fresh green beans simmered in a savory mushroom sauce and topped with crispy homemade pan-fried French fried onions. Stir the soy milk and vinegar together in a medium bowl. Add the onion rings and submerge as many as possible. Allow onions to soak in the milk mixture for at least 30 minutes. Mix the flour, salt, pepper and cayenne together in medium bowl or large zipper bag. Remove the onions from the soy milk mixture, discarding any excess liquid. Transfer the onions to the flour mixture and toss to coat. Heat 1/4 cup of oil in a large skillet over medium-high heat. Once the oil begins to shimmer, add the onions in an even layer, only adding as many as you can without too much overlapping. Cook 2 minutes and gently toss once or twice with a spatula. Cook another 2 minutes and flip again, using the same technique. Once the onions begin to turn brown and crispy, after about another 2 minutes, remove and transfer to paper towel lined plate. If any onions remain after the first batch, repeat, adding a bit more oil to the skillet if needed. Add the olive oil to a medium skillet over medium heat. When it’s hot, add the onion and sauté until softened, about 5 minutes. Add the garlic and the mushrooms. Sauté until the mushrooms are tender and release their juices, about 5 minutes more. Pour in the white wine and simmer, stirring occasionally, until liquid is reduced by half, about 2 minutes. Add the flour and stir to form a paste with the remaining liquid in the skillet. Slowly pour in the soy milk, stirring constantly. Stir in the soy sauce, pepper and green beans, then bring to a simmer and reduce heat to medium-low. Simmer, stirring occasionally, until the sauce is thick and the green beans are bright-green and tender-crisp, about 10 minutes. Preheat oven to 350°F while the sauce and green beans simmer. Transfer the bean mixture to a 9-inch baking dish and place it in the oven (or if you’re using a cast-iron skillet, you can transfer it directly to the oven). Bake for 20 minutes and top with the French fried onions before serving. The green bean casserole portion of this dish can be prepared in advance up to the baking step. Allow the casserole to cool after it’s finished simmering and either transfer it to a storage container or refrigerate in the dish you plan to bake it in. You can begin soaking your onions and mix the flour coating early in the day. Start the coating and frying process when your casserole has about 10 minutes of baking time left. Love this “classed” up version. And agreed, cooking with wine makes everything taste better!! 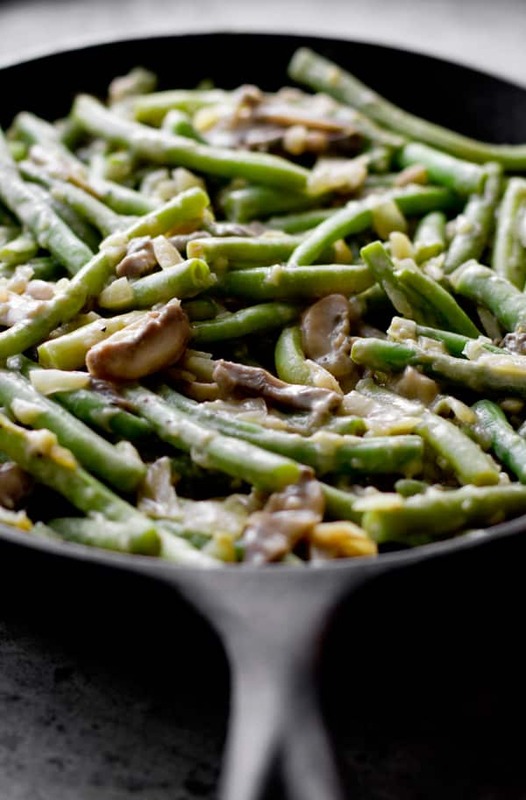 This is one of the best looking green bean casseroles I’ve ever seen – the wine must have something to do with it ;). oh my goodness, this looks so good! Those onions look amazing! The last few years the green bean casserole has been sub par at our thanksgiving, I think I will have to try this recipe this year! I think you’ll love this! The onions were so darn good…honestly, I think I could just eat a big plate of them for Thanksgiving and be happy. I am LOVING the sound of this! Green bean casserole is definitely one of my holiday favorites! Umm, yeah there was definitely room for improvement and you just perfected green bean casserole! I love green beans but loath the classic Holiday casserole. I am totally making this!! Thanks so much for sharing! Yes!!! I hope you love it as much as I did! Green beans have never looked so appetising! Oh my! I dont think I’m waiting until Thanksgiving to try this one! Pinned and added to this weeks list 🙂 and I strongly agree with the gourmet grandma..why use water when you can use wine..love it! I’m really not sure that there’s anything that wine doesn’t make better…I’m going to try adding it to more of my meals from now on! And BONUS, once it’s open, you pretty much have to drink the rest of the bottle. Win/win. Love this totally from-scratch casserole! Definitely worth the extra time and energy. Could you please recommend a substitute for soy milk? Might almond milk do? Or? Thank you! Seems delish! Hi Laurel! Unflavored almond milk should work just fine. Enjoy! I absolutely love green bean casserole and have eaten it for dinner (just the casserole) many a time but then I found I was allergic to soy and the soups have it in them so I didn’t know what to do. Trying my own sauce was a big failure. I’ll sub almond milk in this and see how it goes. Sounds delicious. My husband actually made a dinner of this one! Unflavored almond milk should work out fine as a sub for the soy milk here. I hope you enjoy it! My sister is allergic to mushrooms. Is there anything I could substitute, or are mushrooms essential to this recipe? Thank you so much! Hi Matthew! The mushrooms aren’t totally necessary. I’d suggest just leaving them out, though if you’re feeling adventurous you could substitute some other veggie or some extra green beans. If you do substitute some other veggies just use a cup, as mushrooms shrink up quiet a bit during cooking, and add them with the green beans, rather than early in the process when the mushrooms would go in. Thanks Sonia! Hope you enjoy it, and I would love to hear how it works out! Sounds yummy! Do you think you could use a gluten free flour blend? If not, is there a gluten free flour you could recommend as a substitute for all purpose flour? Thanks and Happy Thanksgiving! Thanks Linda! I haven’t tried making a gluten-free version of this, so I can’t say for sure, but I do have a few guesses as to what might work. For the onions I think chickpea flour might be your best bet. For the casserole, I’d try arrowroot or a bit of cornstarch dissolved in cold water. You’ll probably need less than the amount of flour called for. I’d try adding a bit at a time until you get the right thickness. If you do try the substitutions I’d experiment a bit ahead of time since these variations haven’t been tested. Good luck and Happy Thanksgiving! Thanks for the recipe! I ended up making it three times for various Thanksgiving feasts I had, and it was a smash hit, even for carnivores/processed food lovers. I’m gluten free as well, and I found that the recipe worked just as well with subbing in gluten free flour for both the onions and the casserole. – -The first time I made it, the beans were rather crunchy. The second two times I steamed the beans for 10 minutes before adding them to the sauce, and they were perfect. –In order to make the recipe a bit more like the original and give it an extra texture, I halved the onions in the casserole and doubled the fried onions. Then I stirred in half the fried onions right before putting in the oven. I also cut the beans into 1 inch pieces to make them more bite-sized. Fabulous recipe overall, definitely a great eye-opener for people unfamiliar with vegan food. What would be a good substitute for the white wine? White wine vinegar? White grape juice? I’d like to make this for Thanksgiving but I’ll be in a strict no alcohol setting. Vegetable broth should work, it just might need a few extra minutes to cook down. I hope you enjoy it! This serves 4 to 6. Enjoy! I love all your recipes! I am prepping the items today for this one. Question: I don’t have white wine on hand. I DO have a apple cider wine. Would that work? Thank you! I think the flavor will be very different if you go with cider vinegar. Vegetable broth might be a good bet if you have some of that on hand. Oh i love these. Theyre so tstaty. Thanks for sharing this recipe. I am just learning to cook heart healthy and diabetic. Struggling a bit. We have removed all fried foods and red meat and from our diet. We are adding vegetable, which neither of us have ever eaten. My husband really likes green beans and I thought this might be a good recipe for us to try. If I fry the onions, I would like to use a substitute for the all purpose flour. I have all kinds of “healthy” choices in my pantry, but unsure how to use them. Could you suggest an alternative, or do you think whole wheat flour, oat flour, buckwheat flour, or white corn meal would work? Lastly, I confess to never having eaten green beans. It appears the fried onions are an important part of a green bean casserole. Would you please give your opinion on whether I might be able to substitute baked vidalia onions as a topping. Thanks! Hi Lynette! I think whole wheat flour would work as a substitute, and if you’re looking to avoid frying altogether you could try working with a recipe like this one for the topping: http://inspiralized.com/how-to-spiralize-an-onion-healthy-onion-rings/ You cold probably substitute a vidalia onoin for the red if you like. 🙂 I hope that helps! Good luck!